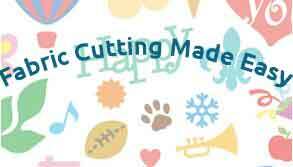 Not so much free motion quilting instructions but, following on from my tips for beginning quilters, I decided to put together my top free motion quilting tips. Note, it does take practise, not many quilters get it right first time. Expect some odd patterns and snarl-ups till you master it! 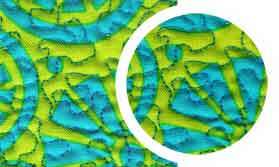 1)Free motion quilting is a lot about keeping a rhythm. When you start, it might be helpful to decide what speed (NOT really slow nor flat out) is comfortable for you. If your machine doesn’t have different speed settings then put some sort of block under the foot pedal so when you mash it down it goes to that speed. That takes thinking about the speed and your foot out of the equation and helps you to concentrate! 2) A good pair of “rubberized” garden gloves (less expensive than QUILTING GLOVES) to grip the quilt will help you move it more easily. 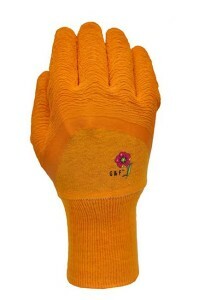 Seriously, I’ve found these to work a treat! 3) Be sure to have a large enough workspace that the quilt isn’t pulling either before or after it goes through the machine. If it drags before you’ll have shortened tighter stitches than you’re hoping for If it drags after it goes through the machine, you’ll have longer stitches than you’re hoping for. 4) Start on small projects… practice, then make something small and simple, like a placemat or table runner. Gradually work up to things a bit larger to get the idea. Much of improving machine quilting skills is lot’s of practice to get a good feel for what you’re doing. 5) Always start a quilting day with a small practice swatch of quilting to get your feel for the day. 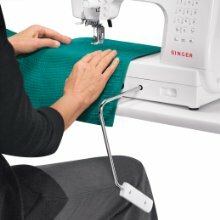 6) If you think you need a new sewing machine for free motion quilting, remember that most feet, bobbins, etc are all unique to a specific machine. You might want to check to see if the feet you have for your existing machine fit a new model and save yourself some money! 7) Accessories which are extremely helpful are walking foot (dual feed), needle up/down, knee lift. The latter two esp. when machine quilting and you want to turn a corner on the applique. Some machines will come with the walking foot accessory and knee lift included. It’s pretty difficult to do free motion quilting without them, certainly in my experience anyway! This video shows some free motion quilting in action. The Janome Memory Craft 1200 has these (walking foot, dual feed, needle up/down and knee lift) included as well as having a foot pressure adjuster and variable zig zag. 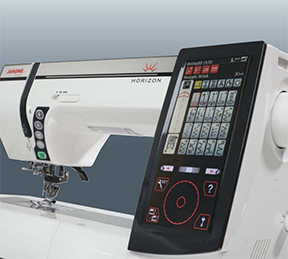 It’s a dream for free motion quilting and well worth a look if you’re thinking of investing in a new sewing machine.